Retro chic with space to spare, this entertainment console houses all of your media in sleek style. 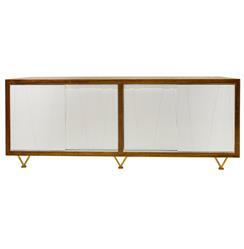 Framed in natural, brown wood grain, the classic cabinet has sliding, white bias-patterned doors and gold hair pin metal feet. A shelf on each side and drilled-out openings on the back make it ideal for electronic equipment.